Last year, an exhibit at the Sail Power and Watersports Show at Earls Court showed that the Atlantic had become a virtual Piccadilly Circus of rowers, with crews crossing almost weekly. In 2009, rowers are crossing the other oceans as well. This year's show is wedged out with boats that are going to cross the Pacific and the Indian Oceans, and one intrepid sculler plans to row the Atlantic solo. Today, the Indian Ocean race. The Woodvale Challenge pits rowers against the Indian Ocean, racing from Geraldton, Western Australia, to Mauritius, a 31,000 mile row that will take the fours about 60 days and doubles 80 days. Two of the boats were on show at Earls Court. 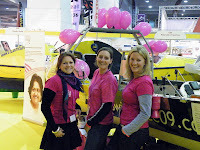 T he Ocean Angels hope to be the first female crew to row across the Indian Ocean. Their flyer says in big letters they will be rowing NAKED, but before all you lecherous males book your tickets for Geraldton they made it quite clear they were going to row out of helicopter range of the Australian coast before they strip off. Angels Amy, Fiona and Jo were on the stand and fizzed with enthusiasm and fear in equal measures. Fiona rowed the Atlantic last year, and Amy was a leading light of La Figarow, the crew of the waterman's cutter that, to quote Amy, was 'first across the finishing line' in the London to Paris race earlier this year (for an alternative version, click here). Jo plays hockey and is a chartered surveyor, and is wondering what she has let herself in for. The picture is rubbish because I had accidentally knocked the camera's settings thingy to 'crap'. Guy Watts and Andrew Delaney have a brand new Rossiter boat and are going for two records - the first pair crew to cross the Indian Ocean and the youngest (they are both 25). Guy is pictured in his boat, unfortunately looking as though his head is being cut off by a strap. So sorry about the pics. But best of luck to both crews - I personally think you are all bonkers, but in a nice way. And the cancer charities they are supporting are very worthwhile, so visit their websites and sponsor them now!